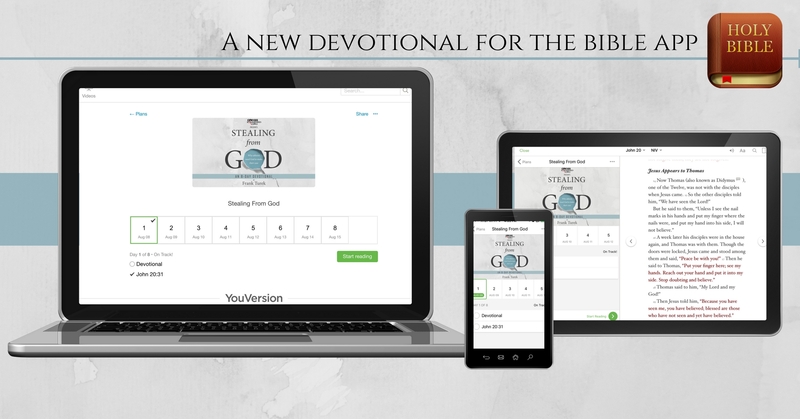 Get the FREE Devotional for the Bible App. Click below! This is a great book, I have never had Christianity explained in this way. I have never heard atheists arguments explained in this way. Thank you. Stealing from God by Frank Turek is engaging and full of pertinent information that will help equip any believer who is serious about the truth. This book will help further my study of Christian Apologetics and help to share and defend the Christian Faith. This book has helped me learn a lot more about God. The book is a simple way to help people learn how to think and use logic in their life. Frank's book should be in every middle and high school science curriculum. This is the stuff they never taught when I was in school. ( and still, don't) Frank's fresh approach to this topic is enlightening and reveals God's character more to the readers. I am learning a lot from this and it encourages me to pass this education to my adult children etc. I am now searching for an atheist to talk to. I helps give me ideas on how to talk to them. my immediate family souls, then my Jesus family souls around His creation and also for my soul, because NO ONE is strong enough to BURN ALIVE IN A VERY REAL HOT FIERY HELL FOREVER. I love you family in YAHusha and I cannot wait to have the biggest, best and most fun family reunion ever recorded in history, which is soon to be in heaven. HalleluYAH AND HalleluYAH heavenly DAD YAHUAH Almighty!!! In this age of uncertainty the Truth remains our Rock. Recognizing self-defeating arguments emboldens Christians to stand firm in our faith and engage a world that approaches End Times. Half way through the book now, and very useful in everyday social environments. I use the techniques in the book to talk to the atheists at my gym. FANTASTIC! This book takes the tiger by the tail and calls those that rant against Christianity to the carpet, with THE EVIDENCE, THE TRUTH, and breaks down EXACTLY what they "stand" for and against, and what is shown in this book, they have NOTHING to stand on. EVERY CHRISTIAN should know the facts and tactics, atheists use against Christianity, and with that knowledge, the atheist sand castle can't possibly stand. Thank you, Frank for all the effort and research to put this book together. It compels me to know Hiis Word and their tactics, and now I feel MUCH more equipped, and confident when I encounter and engage, an atheist, not to rant back at them, but to present real truth, to help them think and prayerfully find who it is they rage against, and truly find Jesus. This is a book that must be read by all. Regardless of your current beliefs, Frank Turek's "Stealing from God" will get you thinking. And, thinking is exactly what our world needs to return to doing soon since it seems most have nearly completely abandoned it. Atheist, where is thy evidence? This book is informative and beneficial in that it addresses the critiques of the atheists, and unquestionably manifests how they have no evidence to support their claims, they need to "steal from God." The evidence that Turek uses to support theism is well articulated and supported. It definitely increased my faith and reason for my beliefs.